The Dorset Churches Web site aims to produce brief information about Dorset church buildings. For each Church listed in the index below, there will be a photograph of part of the exterior and (in some cases) with additional information on published sources, guide-books and bells. I now have basic pages for all Dorset churches, but many do not have either images or descriptions. I will attempt to remedy this over the next few years. Those with a more serious interest in Dorset churches will need to refer to the standard printed sources. Hutchins' History and antiquities of the County of Dorset (3rd ed., 1861-75) remains invaluable and is a very good example of an eighteenth century county history. It contains descriptions of churches from the Rev. John Hutchin's first edition of the history (1774), in most cases updated by the editors of the third edition. The Royal Commission on Historical Monuments for England (RCHME) have produced five volumes of An inventory of historical monuments in the County of Dorset (1952-76) that contain a great deal of interesting information on churches and other buildings. John Newman and Nikolaus Pevsner's volume on Dorset in Pevsner's Buildings of England series (1972) can be rather brief but contains many witty comments and is always informative. Supplementing these "core" resources are other, locally published, works, e.g. : Pitfield's Dorset parish churches A-D (1981) and Purbeck parish churches (1985) Both combine textual descriptions of each church with copious illustrations. The Dorset Historic Churches Trust's illustrated booklet Dorset Churches (current edition, 1988) also contains brief descriptions of selected churches and is for sale in some churches (price in June 1999: £3.00). The Proceedings of the Dorset Natural History and Archaeological Society contain many articles of relevance to church architecture and history, especially the "Notes on some Dorset churches" by Glynne (1923-24) and a series of articles on church architecture and fittings by Long (e.g. 1923a, 1923b, 1924). Naturally, church guide books can also be a major source of information about both history and architecture but can vary in quality enormously. Those published by the Churches Conservation Trust (formerly the Redundant Churches Fund) are particularly good. 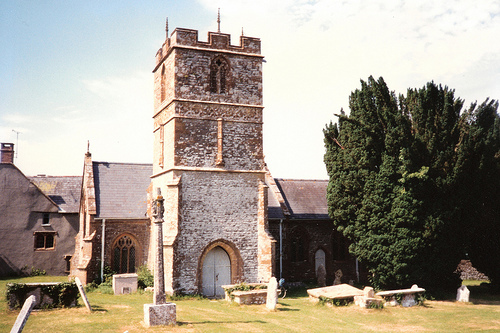 The most recent account of the church bells of Dorset is by Christopher Dalton (2000-2003). For these pages I have tended to rely on the earlier published descriptions given by the great campanologists Raven (1903-06) and Walters (1938), supplemented by information given by the RCHME and individual guide books. For up-to-date information on bells used for change-ringing, I have used Dove's A bellringer's guide to the church bells of Britain (8th ed., 1994), supplemented by information taken from the bellringers' newspaper The Ringing World and the annual reports of the Salisbury Diocesan Guild of Ringers (SDGR) and the Dorset County Association of Church Bell Ringers (DCA). Wherever possible, I will now update these using the latest (10th) edition of Dove's guide (2012). All of the churches included here have been visited within the past twenty years (since 1996), which is quite a long time for a project of this nature. I initially traveled mostly by bicycle or on public transport, so the churches described here were - to some extent - at first selected by being either reasonably close to rail or bus routes, or within easy bicycling distance of my parents' house in Wool. Others have been visited with my wife Rebecca, although I still (re)visit churches by public transport and by walking. These pages were hosted for many years on personal web space provided by the University of Bath. I have now migrated them to their own domain (http://www.dorset-churches.org.uk). For now, I have kept changes to a minimum, although I have needed to make some small changes to site structure. Please note that the inclusion of a building on these Web pages does not mean that they (or their environs) will be open to the public. Some are located on private land, others are no longer used as church buildings and have been converted to residential (or other) use. Dalton, C., 2000-2005, Bells and belfries of Dorset, 3 vols. Ullingswick: Upper Court Press. Available from: Christopher Dalton, Upper Court, Ullingswick, Hereford HR1 3JQ. Dorset Historic Churches Trust, 1988, Dorset churches. [Dorchester]: DHCT. Dove, R.H., 1994, A bellringer's guide to the church bells of Britain, 8th ed. Guildford: Seven Corners Press. Glynne, S., 1923-1924, Notes on some Dorset churches. Proceedings of the Dorset Natural History and Antiquarian Field Club, Vol. 44, pp. 86-104; Vol. 45, pp. 12-74. Hutchins, J., 1861-1873, The history and antiquities of the County of Dorset. 3rd. Ed., edited by W. Shipp and J.W. Hodson. 4. vols. Westminster: J.B. Nichols. Jacques, H. and Keen, L., 1992, Dorset parish churches: building and restoration, 1819-1909: catalogue of an exhibition held at the Dorset County Record Office, Dorchester, Dorset, 12 September to 4 December 1992. Dorchester: Dorset County Council, Dorset County Archives Service. Jenkins, S., 1999, England's thousand best churches. London: Allen Lane, the Penguin Press, 1999. Long, E.T., 1923a, Dorset church towers. Proceedings of the Dorset Natural History and Antiquarian Field Club, Vol. 44, pp. 15-39. Long, E.T., 1923b, Dorset church fonts. Proceedings of the Dorset Natural History and Antiquarian Field Club, Vol. 44, pp. 62-73. Long, E.T., 1924, The church screens of Dorset. Archaeological Journal, Vol. 81, pp. 127-161. Mee, A., 1939, Dorset: Thomas Hardy's country. London: Hodder & Stoughton. Newman, J. and Pevsner, N., 1972, Dorset. (The buildings of England). Harmondsworth: Penguin. Pitfield, F.P., 1981, Dorset parish churches, A-D. Milborne Port: Dorset Publishing Company. Pitfield, F.P., 1985, Purbeck parish Churches. Milborne Port: Dorset Publishing Company. Raven, J.J., 1903-1906, The church bells of Dorset. Proceedings of the Dorset Natural History and Antiquarian Field Club, Vol. 24, pp. 103-148; Vol. 25, pp. 33-128; Vol. 26, pp. 205-221; Vol. 27, pp. 93-137. Royal Commission on Historical Monuments (England), 1952-1976, An inventory of historical monuments in the County of Dorset. 5 vols. London: HMSO. Sackett, T. and Sackett, E., Francis Frith's Dorset Churches. Salisbury: Frith Book Co., 2000. Walters, H.B., 1938, Dorset church bells. Proceedings of the Dorset Natural History and Archaeological Society, Vol. 60, pp. 97-120. Dorset Historic Churches Trust, authoritative information on Dorset's churches. Dorset Churches, photographs and information on more than 400 Dorset churches, from Peter Walker. Images of England, database of images of listed buildings, run by the National Monuments Record, the public archive of English Heritage. A Church Near You, the parish finder produced by the Church of England. The Diocese of Salisbury, Most Anglican churches in Dorset - except for some in the north-west and east of the county - are in the Diocese of Salisbury. Salisbury Diocesan Guild of Ringers (SDGR). Dorset County Association of Church Bellringers (DCA). Dorset Bells and Bellringing, Web pages listing ringable towers in Dorset. Dorset Life - The Dorset Magazine. Dorset - the Magazine for People who Like to Explore. Last modified: 15 January 2017.